Carbonite not backing up my videos! I was shocked to find out this morning that the online backup service, Carbonite, doesn’t automatically backup videos anymore! According to their GetSatisfaction page, they claim that user’s requested this feature as it was the reason for huge backup files. That’s fine and given that I now have 127GB of video to upload, I understand the issues. People might have slow connections and want to get the important stuff done (family photos etc.). However, I signed up for Carbonite over two years ago and at the time they backed everything up! Buried in all that text however, is a method that will allow you to actually select the file types you want and Carbonite will then back them up. Just right click on a file of the type you wish to back up and select Properties. Open the Carbonite tab and you should see this screen. You can now check the “Back up files of this type” option and hit okay. 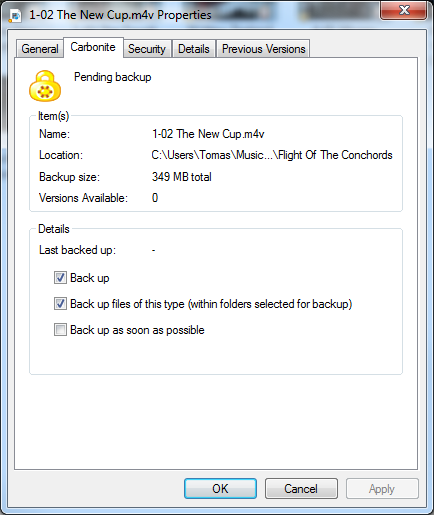 If a file of that type then resides within a folder you have marked for backup, it will include all of them. Useful for videos and other files that you have a lot of that Carbonite doesn’t automatically include. I now have an extra 165GB of data to backup which is going to take quite-some-time! I agree. I stopped using them a few months back after I realised they were throttling the backup speed. I’m using CrashPlan now and I find them pretty good. Upload speed isn’t great from the UK, but the service has been good to use so far. i hate that carbonite did this. i lost three years of precious videos. also they put you on hold forever and the restore didnt work fully.